Basic test to see if the chosen resolutions fit as intended. The effect layers and exe files are minimal atm to save some confusion.There will be more to come. The installer is untested except for my own tests. Instructions will auto launch after extraction to view the instructions after installation open SETUP INSTRUCTIONS.txt open the KEY LEGEND.bmp for a brief description of the user exe files. In the final release i will add some All in One.exe files to simplify some choices. At the moment there are 7 "types" of exe files they all have a different effect (see KEY LEGEND.bmp. I need to know if you discover out of position Helmets. To repeat this is a taste of what will be available and is NOT final. You will need an original rfactor.exe "some" cracks will not allow certain plugins to work. You may also need netframework and visual c installing (see SETUP INSTRUCTIONS.txt). All screenshots added by me are unedited ingame screen captures. The latest images are for development purposes only and are not currently available but will be available in the near future as part of a 4.0 test. 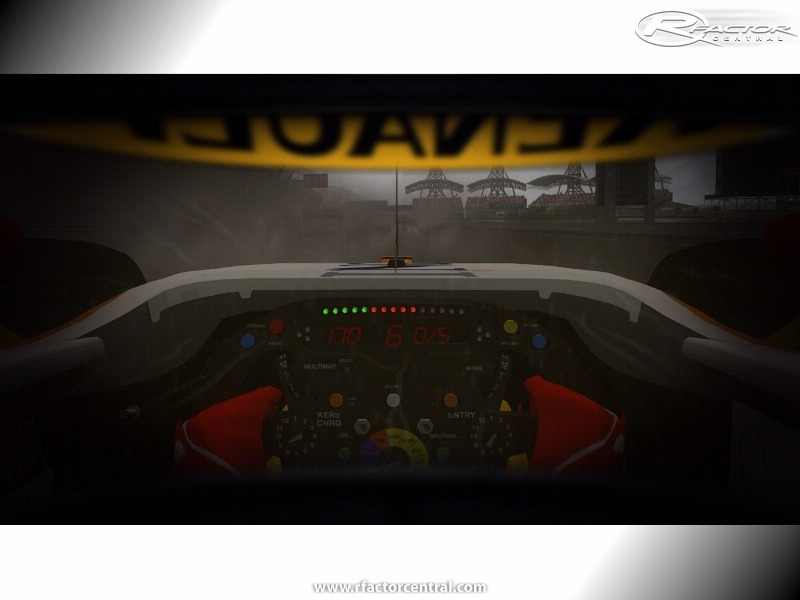 Newly added NFS2 styled helmet which does not require any helmet installer it only needs TVSTYLE , the .rar should be extracted to "rfactor" and it also contains a beta Rainspray.tga to give a falling rain effect in Cockpit mode , it will work in TV cam as well but not as good and in trackside cam is not really effective at all. There are also some alternative helmet views included for you to try out (Readme will be left in "rfactor-root" after extraction and the alternative views are inside Plugins/TVSTYLE/NFS2-folder). Resolution patches are also include and you will need to add them to the NFS2 folder by copying the Newgraphics.ini that matches your resolution. Total new installer coming soon in Ver3.0 with some exe files to automate 1 of 4 chosen Bruce Animated profiles (start menu context and also an exe at the root if you dont want start menu context installing) + cleaning utilities + hdr_tvstyle_wombats fix and undo hdr_tvstyle_wombats_fix.exe and automated tvstyle resolution installers + corshaders upgrade and downgrade.exe(undo) . Italian TVStyle Helmet view with some added animations . You'll also be able to run this outside of the helmet as a fullscreen blind/overlay . Thanx to Italian TVStyle's Dinix and Carlomaker for permision to include their files. any donations please give to the "Cystic Fibrosis Trust". alt-a / alt-n / alt-f =Try these shortcuts they will enable/disable other views. cntrl-f to stop some flashing!!! If you selected the correct resolution just run the game. set styles-mods by editing the default.tv file so you can allow other mods to use the custom views *(Instructions-readme inside the TVSTYLE folder)*. Any other custom TVStyle should work with this addon you can download them from http://www.racingontheweb.net, some very talented people there. 6e66o for his excellent helmet template..
Factor.exe" to the folder created by my installer... and your done. Head Movement "quick basic guide"
Head movement is relative to the Mod+Steering Wheel you are using. Step2: Open your USERDATA folder and find your player file then right click it and "copy"-"paste"it so you have a backup before editing. Under the [Graphic Options] heading edit the number values inbetween the "" marks to alter the ingame head movement or copy the values i use and try them as a starting point. "SOME mods require 0.00000 and also an edit of the cars cam file to remove Cockpit vibration multiplyer or it's pretty shaky on the bumps and undriveable". OK so thats a basic approach to getting some realistic head motion for Cockpit Driving ++ it might also adjust TV-Cam head motion which is undesireable if you also drive that view ++, the values i'm showing are only a guide and will need adjusting between different steering wheels and mods and even different cars within the same mod if they have individual cam settings between teams. If you launch rFactor and move the yaw sliders under the controller section it will undo some of those settings so be careful. I'm sure there are other settings+factors i haven't covered and i might have missed or forgotten about so feel free to leave a post if you see something missing or incorrect. There is also a plr file to download below related to a Brawn video i made for youtube , from memory there isn't so much head roll though. Sry for the delay in responding...@Dan , I use win7 and TVSTYLE works for me...@Rikka yes sure when i get round to trying rf2 I'll see what can be ported over to it...again sry for the long delay in responding. Could I suggest a version for Win 7 as TVStyle doesn't work with it? there is the possibility to have this addon for rFactor2? ALSO* Can people who try the V1 rfDynHud Helmet-Opening+Closing Action files let me know if it works properly , some users report a crash to desktop as the car travels down the pit lane , a workaround is to manualy set the helmet parts in the correct position using the rfdynhud editor then assigning the opening-closing button in the input_bindings.ini. OK links are cleaned and removed where inactive...resolution patch and rfdynhud links are back up...rfdynhud template being made and no not really a UFC fan but more so a fan of martial art films XD. Hi and sry for the delay in responding. I will make some updates tomorrow!! Thank you Bruce. Please re-up the "Resolution patch_s.zip"
rfDynHUD helmet links are dead. Can you upload them again, please? Hi patrod sorry for the long delay in responding...I'm not sure but i guess it should and looking at H.O.F it seems it does ...thank you patrod ! !